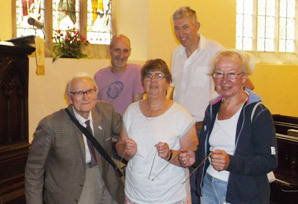 We were dowsing in Coaley Church - with permission - and although the current building is Victorian, there has been a Christian church on that site since since AD 1250. Given the policy of building ‘new’ churches on existing religious sites, in order to harness the ley lines and energies that made it a power spot, it is likely there was a Pagan church there long before that. We were agreeably surprised by just how much symbolism we found, some of it based on the Bible, and some dating from Pagan times. This was common practice, as it made the Pagans feel welcome too. For the same reason, Christian festivals were superimposed on to existing Pagan feast days, and retained many of their old traditions, i.e. fertility symbols such as eggs, chicks and lambs at Easter; the holly and the ivy at Christmas. 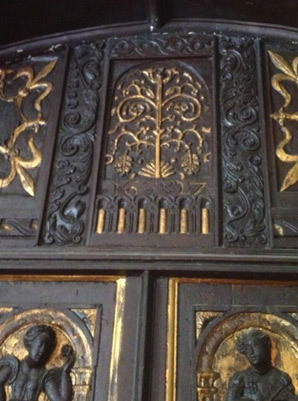 Such symbolism isn’t limited to Coaley Church, however; you will find plenty of examples at a church near you. Favourites were flowers and animals, and include lilies as a sign of the Virgin Mary and purity; palm leaves representing a martyr’s victory over death; oak leaves were a sign of faith, endurance and strength; ivy represents eternal life and immortality. Whereas the Virgin Mary is always shown in blue and white, again symbolising her purity, a red rose symbolises Mary Magdelene, her passion and desire. Grape vines appear a lot in many buildings throughout history, and are a sign of abundance and wealth. And we all know the olive branch is a symbol of peace, success and prosperity. Not surprisingly, animals represented something more powerful, and dragons were surprisingly versatile. On shields and in heraldry, dragons were a sign of the defender who is strong, protective and brave. The Chinese have always been associated with dragons, and in the east, the dragon tends to be benevolent, but is considered malevolent in the west. To the church, the dragon symbolised the old ways of paganism and needed to be demonised; hence the depiction of St George slaying the dragon. Each of the Apostles is represented by an animal; the lion is the king of beasts, associated with sovereignty, stateliness and bravery, and St Mark is symbolised by a winged lion. I’m not sure what it is about wings, but a winged bull is the symbol of St Luke and the eagle, king of birds, means faith, courage, vision and power, a sign of the resurrection, and represents St John. A sheep or a ram symbolizes self sacrifice, as in Jesus being the Lamb of God. Like the olive branch, a dove is a symbol of peace. The Phoenix, traditionally shown as rising from the ashes, symbolizes death and rebirth. Fish represent virility and fertility, whereas a serpent has many meanings. It can represent sexual potency and destructive forces, as demonstrated in the story of Adam and Eve, but it also has connections with healing. It can be associated with wisdom and authority, but also with divine retribution. As for the Pagan bits, our leader for the day, Barbara, who had done a massive amount of research and preparation, encouraged us to inspect the windows, font, pulpit and stone work on the pillars. The most obvious were crosses, halos and angels (those winged creatures again). We were delighted to find the Tree of Life in one of the stained glass windows, a very ancient symbol. Having dowsed and found that little lot, we turned our attention to dowsing how many churches had been on that site - five. We dowsed for the footprint of the original church, well within the confines of the larger one we see today. So how many fonts had there been? Again five, and we were thrilled when our rods indicated their different locations, and we confirmed each other’s findings. Outside the sun was shining, and we dowsed for energy lines, and found Coaley church sits on a couple of ley lines. Ley lines aren’t symbolic, they are a strong reality, and some sensitive people can feel their energy even without dowsing rods. Our Saturday turned out to be truly fascinating and rewarding, and the six of us wished very much that more of our members had been there to enjoy it too.